This entry was posted on July 8, 2014 by Jessica Anderson. The 2013 winning pooch. Who will be this year's champion? 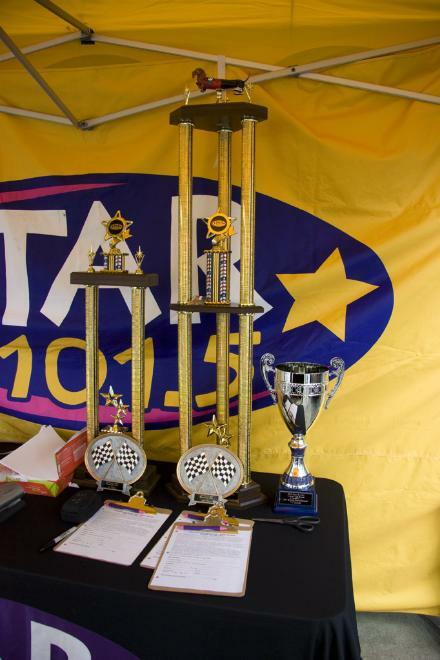 Join the Trophies2Go crew for the most anticipated event of the summer - the 18th Annual STAR 101.5 Wiener Dog Races! This year's event takes place on Sunday, July 13th at Emerald Downs in Auburn, WA. Gates open at 9am, horse racing begins at 2:15pm, and the First Wiener Dog Heat will take place at approximately 3:30pm. Once again, we are proud to be the official awards sponsor of the event. The ultimate wiener dog trophy will be going home to a deserving 4-legged athlete! 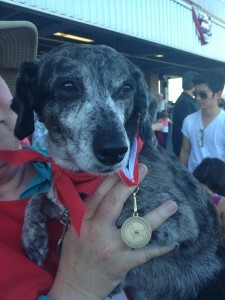 24 dogs Compete, but only one will win the coveted Wiener Trophy! Only purebred dachshunds can enter the race. There are 2 preliminary wiener races, with a race final deciding the top dog. The race is done in the blink of an eye, with local celebrities Kent and Allen announcing which dachshund comes out on top. New this year is the Fan Favorite! Click HERE to vote for your favorite dog, with the winner featured at Sunday's race. Trophies for the winning wieners. This event guarantees lots of laughs in a family-friendly atmosphere. Hope to see you there – we’ll be the ones carrying the trophies!